In the winter we have to be more flexible. Our adventures don’t always work out. The weather can change radically from one hour to the next, making what we had planned too dangerous or miserable. Instead of being disappointed, we try to make the best of the situation. We have learned to appreciate that nature sometimes forces us to let go of our agenda and live in the moment. We take the opportunity to get creative, looking for adventure in unexpected places. This weekend we had grand plans. We booked a hotel in Bellingham, WA and intended to snowshoe up to Artist’s Point. We hoped to capture a photo of one of our favorite mountains blanketed in snow. We had been looking forward to this trip for almost two months. Saturday, we loaded up the dog beds and our gear and hit the road for the 3.5 hour road trip from Seattle to Mount Baker. When we left Seattle it was about 32 degrees and foggy but the weather report at the Mount Baker Ski Area said clear, crisp and sunny so we were optimistic. 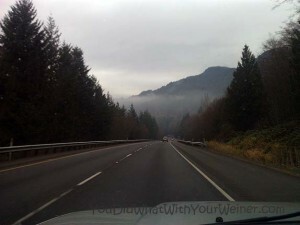 When we got to Bellingham, it was shrouded in fog. The mountain weather report still assured us it was a sunny, bluebird day up there so we drove on. We arrived find a lot of clouds. As we passed the lower ski area, we did catch a glimpse of blue sky and Mount Shuksan through the clouds. Three miles later, at the upper ski area, we were completely surrounded by clouds and fog. The temperatures were in the high 20s (Farenheit, for our international friends) but once we were moving the cold didn’t bother Chester and Gretel. They scurried along with butts wiggling and tails wagging. Optimism about the weather quickly turned to delusion. As we hiked higher, the fog got thicker. Everyone we passed on their way down said they couldn’t see anything. We hung onto the hope that the sky was going to miraculously open up just for us. As we continued to plod up the hill, we processed the reality. We still had a couple of miles to go and we weren’t going to see anything. We ultimately decided that we would rather go back and spend some time enjoying the City where the view was less important. Unfortunately, we didn’t get any photos of this part of our trip because 1) all we saw were clouds and 2) we didn’t want to stop and make the dogs sit in once place because of the freezing temperatures. We stopped for dinner in Downtown Bellingham and took the dogs for a long walk. We window shopped and experienced the night time vibe of the streets. Later, we checked in at our hotel, snuggled under the covers and watched a couple of movies. We woke up the next morning to more clouds and fog. We had planned another view-laden hike but there was no way we were going to see anything. We decided to put that hike on list of things to do another time and look for some things around down we hadn’t done before. We took our time getting ready. It felt good to relax and get going when we felt like it instead of having to push to stick to an agenda. 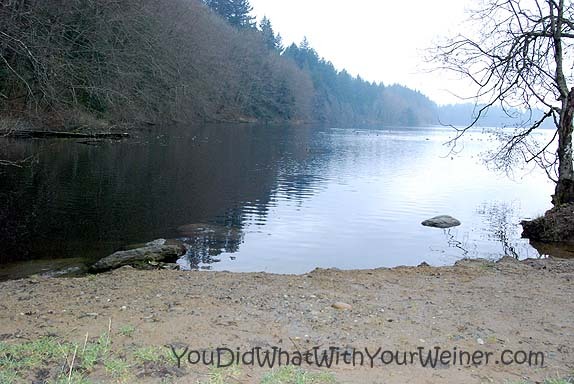 The first thing we did was visit the dog park at Lake Padden. Chester and Gretel chased some balls (well, ok, Gretel) and barked at the big dogs through the small-dog-area fence. We also walked a short trail down to the lake. After, we drove into town and Chester and Gretel snoozed in the car while S and I toured the Museum of Radio and Electricity and had lunch. We followed that with a stroll in Arroyo Park. We headed back to Seattle earlier than we had expected but decided that it would be nice spending a relaxing evening at home snuggling on the couch with the dogs instead and of making a mad dash for home, feverishly throwing our stuff in the house and then rushing to bed (like most of our weekends end). We had a great weekend even though our original plans were a bust. We still got to take a nice road trip, go on a mini showshoe trip, leisurely meander around Bellingham and visit a new dog park. Sometimes slowing down is an adventure in itself. Glad you had fun anyway! Are you going to write a review of the dog park? You read my mind 🙂 Yes…and of the hotel we stayed in. It might take a week or so though. Sorry about all the fog, it really is a beautiful part of the country to explore reguardless. Sometimes those unexpected curve balls are the best part of traveling! I’m glad you guys enjoyed being spontaneous and, that mountain isn’t going anywhere. You’ll see it the next time. Wow! I was also in Bellingham two weeks ago. My mom had a reading there. I hiked at Whatcom Falls Park with Dad and Truffle, my plott hound brother. Keep on wagging! My person’s sister lives in Bellingham so she’s spent some time there. She says she got to take a very scenic hike there last summer but she didn’t take me on the trip. I went to college there and I love it. Your person’s sister is very lucky to live there.